Exciting live rock performances at the legendary nightclub CBGB, from the 1970s to the early 1980s. This is the real thing! Includes drunken audiences spitting on the band and cursing. You'll love it. Good times, good tunes in these exciting live CBGB's performances from the 1970s. Hear the Laughing Dogs doing their Auntie Em comedy act, parody of the Three Stooges, and more. There are some well-known tunes and some songs not released elsewhere. (Since there is a lot of live interaction with the crowd, there is a bit of rough language.) This music is rare and collectible, and recorded off the CBGB mix board. 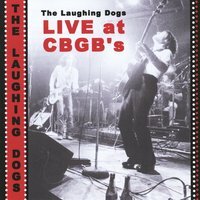 The Laughing Dogs have two live songs ("I Need a Million" and "Johnny Contender") on the original vinyl album "Live at CBGB's: The Home of Underground Rock" and the CD of the same title. There is also a song ("I Need a Million") on "Punky But Chic: The American New Wave" CD. The 2013 film "CBGB" has the Laughing Dogs song "Get Outta My Way" on the soundtrack as one of the bands representing that club during the time period. The Laughing Dogs are on the CBGB Soundtrack CD and vinyl albums as well.